What is it about our dogs? Or maybe I should speak for myself, and – since he can’t type – Angus. I’m just in a tribute mood, perhaps because we’re in the “holidays,” and I’m feeling grateful for lots of things. Angus is at the top of my list. My new job keeps me away from him during the week so I don’t get to spend the same amount of time with him that I used to. He’s 5-1/2 years old, so between halfway and a third of the way through his too-short life, with any luck. Leslie (also at the top of my list) and I don’t have kids, so Angus bears the brunt of our parental feeling. He is spoiled, for sure. But he’s darned well appreciated, too. I try not to regret that I didn’t hunt with him until he was three. It’s hard not to because my connection, I should say our connection, has intensified a lot in our three seasons together in the field. Being away from him during the week and only able to hunt weekends, too, has honed my appreciation of him. Reading a fellow bird hunter’s blog yesterday also has something to do with this. In a post titled “I Slipped His Collar,” Randy described putting his “go-to” dog down in simple, heartfelt but unsentimental words. From his post it was clear he’d been through this many times. I’ve done it once and dread the next time. And I don’t want it to get easier, and suspect it won’t. Glenna and Angus have increased my predisposition toward morbid thoughts, but I came to dogs late in life and am regularly felled by the ineffable and ephemeral connection I feel with them (the dogs, not the thoughts). As I write this, I’m home for the weekend and Angus is bored and playing with his toys. Serial goofiness: rubber ball, shrieking monkey (three of them, in various states of dismemberment), Nylabone, then his chin rests on my knee. He wants to get out, and so do I. It’s these rarer moments of down time together that allow me this reflection and time to wonder if he’s reflecting on anything or just thinking of his next half-cup of kibble, or of nothing at all. Maybe he feels something like comfort having me nearby for a change. I hope so. I know I’m comforted by his presence, even while dreading the end of that. We both need to get out and look for some birds. We’re both social creatures–humans and dogs: we enjoy each other’s company. 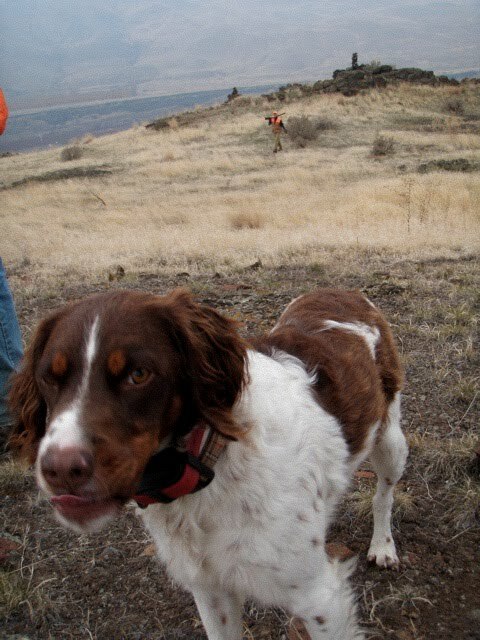 I don’t hunt properly, but go on regular walks during which he’s all over the place tracking scents. He has a companion dog who’s also at home. She’s a cattle dog (English collie-blue heeler mix) in retirement with old hips, eyes, and hearing. Her nose works just fine; and she has started acting as goofy as a pointer when I get home to pet, feed and walk with them. That makes it easier for me to leave them while I’m working, but I think dogs adjust to any routines with their human buddies. I’ve seen three other dogs go, and several chickens (along with a couple snakes I’ve killed): for me, it adds up to simply enjoying the moments as they are given. 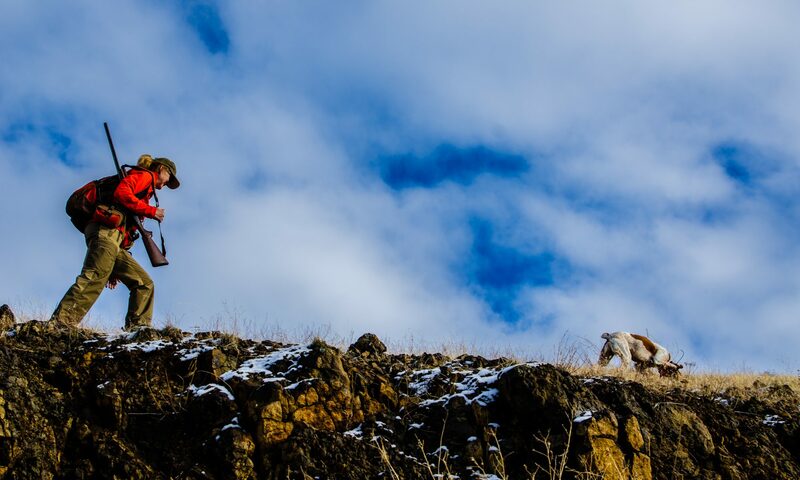 Your days of hunting with Angus (and wife and friends) look glorious! Thanks for sharing. Thanks for reading, Marjorie, and for your thoughtful comment. I appreciate it.